John: Our series is going to be about the Holy Spirit. I like to begin every series with a justification for why we’re going to spend any of God’s time on this subject. You know, whenever we come to a new series to do which is going to take up time, we’re going to be spend time reading and thinking and processing and wrestling, and I always like to think, if there’s only one more series we can do, what would we do? And right now, this is it. And so I’d like to explain to you why I think this is so important that we take on this series. John: The first point is: I think it’s true that many of us have never really considered the role of the Holy Spirit in our life. We might have a heard about it, we might have been told that we need to somehow experience the Holy Spirit, but many of us have not stopped to even really think about it, to look the verses that describe this life in the Holy Spirit. Actually to go a step further, and consider or imagine what it would be like to actually be Spirit-empowered. Probably it’s because most of us just know that it’s something we should do, we don’t really understand it much, so we just kind of the limp along. I think that’s probably a good word, limp along, without the power that’s available through the Spirit. Second point: I think the Holy Spirit is the least understood person of God. You know we might just tacitly assent to the idea, “Yes, right, God, One, Three Persons, One.” And we have a pretty good understanding of the Father, we have a fairly good understanding of the Son, we use those terms, but when we come to the Holy Spirit, we just go, “and He’s one of the Three, let’s just move on.” [Laughter] If I stop to ask you directly — which I will a little bit later, so start thinking — “How do you experience the Holy Spirit in your life? How do you experience the Person of the Holy Spirit in your life?” Not just God encompassing all three, but do you experience the Holy Spirit of as a distinct person in your life? And if someone said, “Tell me about the Holy Spirit. How do you experience him?” What would our answer be? I hope at the end of the series you have a better answer, but I’d like to hear yours tonight in a little bit. The third reason we’re doing this series is because I believe – and this is going to be the theme of this series — some of the series that we do are much more to resolve some sort of intellectual problem in our mind that is preventing us from having a vibrant faith. Sometimes our series are meant to resolve something that would push you forward or give you information about something you might not know too much about. This series I think has to be intensely personal and have intense application, because to talk about the Holy Spirit in a stale way would miss the whole point. I believe that the reason we’re doing this series, if I could just pick one off the screen, would be this one: Because the Holy Spirit gives us direct access to the power of God. And most of us our living life relying on our own power. I think we want more. We have difficulty understanding how to do that. John: We are not covering how to understand the Trinity. One of the reasons for that is because we have already covered it. So if you missed this talk, we spent five or six weeks just trying to understand how it is that we can comprehend the Triune God, and it’s on our website. Go check it out. Here’s something else we are not covering: We are not covering the subject of the Spiritual Gifts, the gifts of the Spirit. Why? Because we’ve already covered it. We did a whole series just about the spiritual gifts, how to understand them, some of them debate about them, and how to identify them in your own life and what it means to have a spiritual gift. Here’s something else we’re not doing: We’re not going to devolve into a discussion about how the Spirit leads us, and how we figure out God’s will. Again, you could say with me, because we’ve already done that series and there’s at least eight podcasts that you can download on that topic on our website that are probably among our most popular. And finally something else we’re not going to talk about too much: About how to hear from God because, say it with me, we’ve already done that too. We did that last September, probably very much like this, a very personal series. Now you might look at all those things and go, “What’s there left to talk about?” I mean, if we’re going to talk about the Holy Spirit, but I am not going to understand the Trinity or the gifts of the Spirit or how He tells me what to do, or how I hear from Him, so what’s left? And that’s why I really say that this series is personal, and it’s about power, because what is missing in all of our discussions to date is a real expression of how your life can be empowered by God. Some of you are immediately skeptical when I say those words. That’s why you’re here. In Exodus, you are allowed to just raise your hand and say, “I don’t know, that doesn’t sound right to me.” And you can do that. Today I expect probably a little bit less of that because I’m going to be just throwing out some things to get us started it this introduction, but if you’re one of those people who right now are thinking, “I don’t know, I think John’s gone Pentecostal on us,” that’s ok. Push back. That’s what we’re here for. I’d rather you wrestle here than just go out there with no understanding at all. John: That’s what we’re not covering. This is the image I put up last week. What do I mean by power? I said last week that if you see this image of a person pushing a car by the side of the road, you would think, they were in trouble. That’s your first thought. They’re in trouble, they’re pushing their car. If I told you that the car they were pushing had a perfectly good engine and all they had to do was get in the car and get it going, you’d think, “Wow, that’s pretty foolish,” that you have a perfectly good engine but you decide on your own ability to push it, to use your own human power when it has an engine. And that’s exactly the analogy for this series: that we have access to the power of God, who’s very much like that engine that could just go, and some of us don’t want to access it, some of us don’t know how to access it. And I include myself in those people. Now we’re going to understand something from scripture. And we’re going to have to look deeply about what scripture means about some points, but the purpose here is to bring more of God’s power into your life so that we all stop looking so sorry by the side of the road pushing that car. John: Here’s what we’re relying on, just so that you know. There’s four books that I have chosen. I don’t expect most of you will pick these up, but some of you might have read some of them. I want you to know that they come from a broad spectrum and, in conversation with people, I have already identified two more that need to be up here that I’ll probably end up picking up. But I want to show the spectrum of belief that we’re looking for this subject. One is from A.W. Tozer. He has a collection of sermons that somebody put together about the Mystery of the Holy Spirit. If you don’t know Tozer, he was one of the greatest preachers of the 20th Century, and he had a lot to say. He had a very deep, intimate relationship with God and wrote about it in profound terms. And as I was reading his sermons, it was really interesting to see. His book is a classic. I know that because the publisher wrote “Classic” on the cover of the book [Laughter] so it’s become one because the publisher wrote “Classic.” The second one, Embraced by the Spirit by Chuck Swindoll. Different perspective a little bit, but somebody who’s been a pastor and a head of a seminary, who’s been preaching for 50 years and writes in the book in 2010, that I had been looking and seeing people who had this power in their the life and, frankly, I realized I didn’t have that, and I needed to write this book to figure out what it was all about and how it is that we find it. A very honest confession by somebody who I can’t say is motoring completely on their own ability, but realized that they could have had more of that power of the Spirit in the life. Robert Morris writes from more of a Charismatic and a Pentecostal background maybe, this book, The God I Never Knew. And also, some of you have read Francis Chan’s book, Forgotten God, and I think that kind of a captures a feeling that some of us just forget about the Holy Spirit in any of our formulations and thinking about God. So we’re reading those and, like I said, a couple of more that I might introduced to you in a couple of weeks. A lot of reading going on. You can pick up some of these and we can talk about them or, as always, I’ll just read them and tell you what they say. How’s that, is that good? Let’s take a break for a moment, for a moment, because we’ve been kind of going with announcements and stuff. Here’s what I want you to do. Before you hear a single thing I’m going to say about the Holy Spirit today, I want you to write down what questions you have about this Holy Spirit. And I’d like, if possible, if you want to, if you feel comfortable, to read some of those in a moment to people. So take a break, stretch, you don’t have to sit in your seats, let’s just breathe for a moment. There’s a few snacks still in the back, and let’s take about three or four minutes, five minutes, just to write down the questions that you have that you’d like us to cover, that you genuinely think about or wonder about or have said, “I’ve been around and I’ve never had this question answered.” And then maybe we’ll take a few of them and then I’m going to read a couple of scriptures to you, and we’ll be done tonight. John: Anyone want to share some questions that they want to wonder out loud? Yes? Monique: Well kind of the idea like, can the Holy Spirit be earned? So like, besides the idea, because I know we’ve talked about how God sometimes pulls away His presence so that we’d follow after Him and all, so aside from that, that idea aside, what responsibility do we have for losing touch with the Holy Spirit? If we once had it? Does it have to do with the strength of our walk? John: Anyone else want to jump in, yeah? Tiffany: I put down, does being filled with the Holy Spirit mean something different than the Holy Spirit being with us? John: Hmm, yeah, that’s all over that Robert Morris book, yes. Daniel? Daniel: I wrote down, the Holy Spirits is sometimes called the Spirit of Jesus in Acts, so I wondered, does the Holy Spirit have a personality? Is it a distinct person or an extension of power from Christ? John: Very good question. Abby? Abby: I want to know how the Holy Spirit makes your life better or more effective and if it does or can. Charis: Mine’s kind of like Tiffany’s: Is baptism of the Holy Spirit different or synonymous with just receiving Him and being saved. John: I almost made a slide that said what we are not covering also is baptism of the Holy Spirit, but I pulled it, and here’s why: there is a genuine question among the churches about whether there is a second baptism of the Holy Spirit that is needed to infuse people. So, to make it clear, most people believe that there is a water baptism where you publicly proclaim your belief in Christ, all are unified on this. All are unified on the idea that when you become a believer, you are indwelled by the Holy Spirit, the Holy Spirit comes to indwell you, and we will cover those verses at some point later. But what is not agreed upon by all the churches is what is come to be known as the Charismatic or Pentecostal view, which is that you need to pray for a second blessing or a second baptism of the Holy Spirit, which is separate. I would say that the majority of churches do not agree with that, and those who of course focus on the power of the Holy Spirit in a Pentecostal way believe in that, and we might look at the verses which show one way or another. There’s not too many of them, so we can actually do that, we’re just not going to do it tonight. But I just wanted to let you know that that will be an issue that will come up, so I’m glad that you have it. I almost said it’s just out of bounds, but I figured we could spend a few moments looking at those verses a little bit later. A way to think about it now is, whether you need that or not, we still need to talk about what is kind of Abby’s question, “What good is the Holy Spirit.” Maybe that’s the paraphrase of what you said, but is there really any additional power that comes from the Spirit, let’s describe that, and I’ve already heard people struggling with the Holy Spirit: is He a “he?” Is He an “it?” Is He separate? How is He going to go on? And we have to start to talk about that next week as we start to look into the person of the Holy Spirit. John: Let’s talk about this power for a moment. What kind of power am I talking about? It’s easy in this analogy to picture the engine being the power. You know, you could think, “Well I can definitely tell the difference between someone who’s pushing their car just because they feel like it, even though it runs fine, verses somebody who just puts the key in and ignites the engine and gets going. Alright, you can say there’s a difference. What’s the difference? Well, there’s that engine, that’s the difference. A lot of power in that engine. The word we’re clearly focusing on is “power.” One author kind of said it this way: Many of us think the last words that Jesus spoke on earth were “Go.” Actually in light of Luke’s account in Acts its possible that the last words He really spoke on earth were: “Wait.” “Wait.” “Wait for the gift my Father promised. And when you receive the power, when you receive the power, then you are going to be witnesses my Jerusalem, Judea, Samaria, to the ends of the earth.” It was important to Him that they wait for this power. Why? Is It Really Better that Jesus Go Away? Why? How do we see the evidence of that power? What does it look like in action to have this kind of power? Maybe if you’re going to ask yourself a personal question, here it is: What does the power of the Holy Spirit look like in your lives? Anyone want to answer that right now? Does anyone have an answer that they want to say, like “I feel that I could respond and say, ‘the power of the Holy Spirit looks like this in my life.’ ” Anyone want to throw it out? Yes. How Do You Experience the Spirit in Your Life? Abby: I see, like, a lot of times in my own life, my own rational decision making based on the logic that I have, and I call it “power of the Holy Spirit,” basically me just making decisions. And so I think I wrestle with this because to have the Holy Spirit doesn’t look any different than just my walk with God, what I would consider the way I come about decisions or conclusions or things like that. Morgan: The power of the Holy Spirit is God working in the conviction of sin. It’s difficult. I have no idea what He does all the time, or the internal workings. There can also be other voices in my head as well. You know, there are times when you feel guilty for things, or fall into people pleasing. But one of the roles of the Holy Spirit is to lead us into all truth. So, yes, it can be very difficult to discern. If we believe that the Holy Spirit actually does that, that the power of the Spirit is to reveal things about ourselves, both good things and bad things. Monique: I don’t know, I guess for me, what makes it more difficult to talk about how it’s present in my life, is that it seems like more intangible, mystical stuff that people think is weird, or whatever. But, and we’re not talking about spiritual gifts, but praying and I’ll start speaking in tongues. Like one time I was talking to someone and we were having a really good spiritual debate, and I wanted to do something, and I don’t know what, and this verse pops into my head, and I have no idea what it is, and I just feel led to read it, and it’s exactly what they needed to hear. Or like, every time I actually feel the presence of God, which is also hard to explain to somebody, because you can’t, like it is a physical thing to feel the presence of God or His love, or that closeness and that kind of spark inside, I guess, when I spend time with God, to me is also aspects of the Holy Spirit besides the more kind of rational things, I guess. Katherine: In my life, I’ve noticed that the Holy Spirit is very much the author of my creativity, in really any aspect of the word. Because I think creativity, I mean first off, you’re creating something, so that’s kind of like, we are created by God to create. And so I feel like we get back to our roots when we create something, be that a sermon, or a piece of art work, or a piece of music, or learning an instrument. So I just noticed that art brings a lot of order to my life, just being a musician-artist, and when I realize that I’m … it’s not about me, that I’m one part of a really big picture, then it’s like you want to work your hardest to make sure that whatever part I am, I want to do really well. And that really opens me up to the Spirit, to say, “Hey, this is bigger than me, and I know that, so I really need your help.” And to just trust that and keep going and do your best. Like whatever you commit to the Lord, you’re not going to be let down. And so that’s just kind of where I want the rest my life, just like recently creating music. It’s been a real blessing even if it’s not always the best. It’s the fact that I’m creating. I think, that makes the Lord really happy. And then the Spirit works through that. Peter: I think that, for me, it seems to center around prayer or worship. So, if I’m, you know, singing on a Sunday morning somewhere, you know, there’s this sense of connection and presence in the music, or the words I’m saying, although the labeler/theologian in me wants to know, well, is that the Father? or… So there’s that, which I think is Spirit-related, and there’s … I always think to the verse, “The Spirit helps us for we know not how to pray,” and sometimes I’ll feel … I’ll see a friend, and I’ll feel like, oh I think I’m supposed to pray, and I’ve been less and less hesitant about jumping when I feel I should. And also, too, like the words or the content of it, sometimes, you know not necessarily to use tongues for me, but I think like, you know, oh yeah, but maybe they’re sensitive about this, like my sister just left for school, and my mom is feeling empty nest syndrome. And you know that sort of thing could be informed by own subconscious, but I feel like the timeliness of it, you know, I think … that’s where I go, partially because of that verse, because that almost gives a name for what I experience. Daniel: I’ve experienced the Spirit the most powerfully I think in dramatic changes of attitude, either when I am talking to somebody about God and my mindset will change, almost become impassioned, and I’ll say what I think the truth is that comes to me. And a lot of those times I won’t remember what I said after that, but they will have been helped. And so, that manifests as knowledge that I wouldn’t have had before. Or even courage, to declare the truth, because sometimes I can be afraid, well, what if that’s not what they think is true, or they reject me. But there have been very real times where that fear has been obliterated without me trying to muster up courage, to be able to declare that this is the truth about God. It’s been powerful. Chris: To me, to answer that question, for me it’s knowledge, right? So, I may not understand something, or I may be struggling with an issue and when — I see knowledge as, sort of like the cliche, it’s power — that for me is very advantageous in all aspects of my life. So I feel like, for me, the Holy Spirit brings knowledge. Monique: I was actually just going to add to that too, like, I think when I’m reading the Bible sometimes, not to take away from doing proper study and understanding the context and all that, but, sometimes I’ll just see God’s character kind of revealed to me, or I’ll make connections, or just feel this deep love, like “Wow, that’s amazing,” and it like really resonates, and I feel like that can be very Spirit-led as well. Joseph: He’s really my energy source for pushing forward to what I know God wants me to do and what God has for me. Jess: Along the same lines as Joseph said, I think maybe the power of the Holy Spirit, I experience that power as a driving force and the source of my perseverance to stay engaging in the journey and trying to find more. John: Many of the things that you said are going to discussed, and you’re going to see verses and you’re going to see an understanding of it. Some of you, I can tell, are struggling with, “Was that God, like the Triune God? Is that the role of the Spirit, because they do have distinct roles. How do we understand it?” But you are talking about the very thing that people observe and talk about. John: You know, when I thought about this question, there are times in my life when I can definitely see the Spirit in a personal way. I am not going to talk about those right now, because I wanted to tell you something that you should know, that the Spirit works in this group in a collective way. Soren and I were talking about this earlier today. You know, there are many times when I am studying and preparing to discuss with you different things, and the first thing that comes up, is as I’m trying to think of way to explain something in a way that’s going to stick and make sense, I’ll come up with a word picture, an analogy, some sort of illustration that I want to use, some sort of insight into the scriptures. And I feel like, I am developing that, and I will present it. And I can tell sometimes, because it seems to resonate more that just something that I would have thought on my own. I can see it on people’s faces. It seems to stick more, and I think there might be some evidence that comes from the Spirit. But here’s the real evidence for me. More than once, as I have been reading and reading and reading other books, I will come across that very same example in somebody else’s book. I have heard it in somebody else’s sermon. I told Soren earlier today that in one case it was so exact that I thought they lifted it right out of one of our podcasts, and I checked the publication date of the book, because I thought, “No way! They totally lifted this,” and it was written eight years before we had done our talk! And it confirmed in me the idea that we do have a God who indwells the entire church and the Spirit is speaking the same thing to different people. And there’s the evidence of it, because I know, I searched my brain, I racked my brain, did I hear this somewhere? Is it subconscious? Is it coming from somewhere else? And the answer was, I’ve never heard this, I know I hadn’t. And when I saw it, not just in mention, but in exact detail, I thought there’s evidence of the Spirit. There’s other times when we study a subject like this, as I start reading books and reading books, I actually develop my own thinking about stuff, and then I’m mortified. Because I realize four years ago we talked about the subject, and I thought, “Oh, my God, what did I say back then because I didn’t even know that subject that well.” And I go back, and miraculously, somehow things that I haven’t learned yet were present in a response to the question or — something more importantly — that one of you said. That’s evidence, almost like recorded in an electronic format, that the Spirit was at work. Because I know as I go back in horror, I don’t think I knew that back then, in fact I’m pretty sure I didn’t. The reason I am panicking is because I’m going back to find out what happened, what did I actually say? I must have said something totally stupid, and there it is. Or your questions, your comments. I mean, you know, we’re going to read four, five, six books for this. You know, what are we able to package into a night? I come in here thinking, I know what we should be talking about, and one of you will trigger something that will send the whole conversation in a different directions and later … months later, when we’re editing these talks to put them up on our site, I realize — I can hear it in the discussion — that question, that comment was the Spirit moving us in the direction we should have gone. It’s there, collectively. If you don’t think the Holy Spirit works in groups, you haven’t read the book of Acts. Because the book of Acts is all about the Spirit working through deliberation and in groups and in the wrestling, and that’s why I like this group, because we get to be one of the rare expressions in the church where people get together to deliberate together. John: Alright, let me read you some scripture to show you the power I am talking about. I want you to go back with me for a second, and I want you to look at the life of Peter. I want you to remember, Peter, who was standing at the trial of Jesus, denying him. I put up the verses from Mark 14:70-71, where they say to him, before he’s about to deny Christ for the third time, and they say, “Surely you are one of them, for you are a Galilean.” I mean why else would you be at the trial of this guy? You must be one of the disciples. And he said, “He began to call down curses, and he swore to them, ‘I don’t know this man you’re talking about.‘” Why was Peter so intimidated? Because Jesus was on trial. But it wasn’t really about Jesus. He was worried that he was next, because he was associated with Jesus, that trial that was going on in front of the Sanhedrin, they were going to call him in. That when they accuse him, “You’re one of, you’re one of them, just like your master deserves, you deserve the same thing. You’re one of His disciples.” And he denies him. We know that that’s the failure of failures that Peter has, where he’s denying the Lord three times. You talked about courage and knowledge. And one of the things that happens here in this story after Pentecost with Peter is that “cowardly” and “afraid to step in” becomes this intense courage that he has to be the spokesperson. Think about the pow-wow that’s going on in the background. Think about what’s going on there, they’re thinking, “Hmm. Which one of us should be the person that stands up to publically proclaim this. Maybe we should pick Peter, the guy who’s already denied Him three times, who showed his cowardice, and oh yeah, is probably the most strong-headed and the most simple-minded of all of us, in this regard. Let’s pick him to give the first sermon at the first Harvest Crusade in Jerusalem. [Laughter] Let’s pick that guy to do it. That’s exactly who they picked. Why? Because the Spirit of the Lord is upon him, and the power of the Lord is in him, and he stands to give this eloquent explanation of who Jesus is. And the response is amazing, but forget the response. People always focus on that. That is the power of the Spirit at work. But it’s the fact that he’s able to even stand to do this. There’s a change, from the Peter that 50, 60 days earlier had just denied Him at the trial. I’m going to read you some more scripture. This is also the book of Acts in chapter 4. Later, there’s a healing. And now the whole city is astir in Acts 3 because of the healing. And so the same people that put Jesus on trial are now bringing Peter and John on trial. Looked at the marked difference in them, from the time that he was cowardly outside, denying the Lord, when he wasn’t even the one on trial, to now he is on trial, by the same people. It says in Acts 4:1-22, “The priests and the captain of the temple guard and the Sadducees came up to Peter and John while they were speaking to the people. They were greatly disturbed because the apostles were teaching the people, proclaiming in Jesus the resurrection of the dead. They seized Peter and John and, because it was evening, they put them in jail until the next day. But many who heard the message believed; so the number of men who believed grew to about five thousand. “The next day the rulers, the elders and the teachers of the law met in Jerusalem. Annas the high priest was there, and so were Caiaphas.” Anybody remember Caiaphas? He was the guy who was presiding over the trial of the Jesus. “John, Alexander and others of the high priest’s family. They had Peter and John brought before them and began to question them: ‘By what power or what name did you do this?‘” Do you remember when they would ask Jesus the same question? “By what authority do you do these things? ” Isn’t this headed exactly the same direction in Peter’s mind? 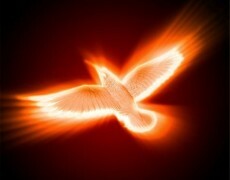 “Then Peter, filled with the Holy Spirit, said to them: ‘Rulers and elders of the people! If we are being called to account today for an act of kindness shown to a man who was lame and are being asked how he was healed, then know this, you and all the people of Israel: It is by the name of Jesus Christ of Nazareth, whom you crucified but whom God raised from the dead, that this man stands before you healed.‘” Where did he get that from? It’s says right there: “filled with the Holy Spirit.” That’s the difference we are looking for in our life, moving for a place where we’re just kind of doing it on our own, to a place where we’re infused with enough of all of the things that you mentioned, to be able to withstand this kind of position. He goes on to even cite from scripture and remind them from the Psalms. Jesus is “‘the stone you builders rejected, which has become the cornerstone.’ Salvation is found in no one else, for there is no other name under heaven given to mankind by which we must be saved.” We get those words. Sure, we know those words. [But] he’s sentencing himself to blasphemy by saying these words! He’s saying that there’s no one under heaven and earth that should be saved except by the name of whom? Jesus. But these words relate to God, and he is standing in front of the people that had convicting Jesus of saying the same words, and saying them right back to them. I know a lot of people who would take that and say, “Absolutely, okay.” And they’re thinking that “God wants me to go to that other next city. So after Jerusalem, what was the next city He mentioned? Okay, we’re going there. Right? Because He wanted us to go to the ends of the earth, let’s just go now, start there, work our way backwards.” But that’s not what they said. You see the difference in Peter between these two events? And the scripture doesn’t leave us guessing at all as to why. It says the difference between cowardly, strong-headed, simple-minded Peter, to bold proclaimer of truth, with courage that he could not summon on his own, is the power of the Holy Spirit. In this introduction, I’m just hoping to entice you enough to say, “I want that.” Some of you might say, “I already have that.” And that’s great. I want to learn from you, that’s why it’s interactive, you’re going to talk to me. But some of us are even skeptical, and I am sometimes when I am reading, thinking, “Hmm.” But I do know one thing: I want that. You can read the story further in Acts 5. They go on preaching and the council actually brings them back and says, “We told you to stop this,” so they throw them in prison. Of course, what happens, the earthquake comes and they escape from prison, and the next day when they go out and say, “Let’s bring them back from prison, now we can give them the punishment,” they’re like, “those guys are out in the temple preaching.” And the people are infuriated, because they can’t prevent them from speaking. I want that kind power. I want that kind of enabling power in my life so I don’t have to feel like I’m pushing the car. I want that kind of power where I feel like, everything that I’m doing as it relates to God’s purposes, which should be everything in my life, is not solely done by my own hands, in my own strength. I mean, God gave me those things, too. But I want that difference. If you do, then join me as we keep going. Lord I confess that I already lack courage because I am afraid of some of the things that we might discover in this series, not only about where we are now, but also about the things that you would ask us to do, and the power that’s available to us. I also confess that I lack courage because I know that in these places, Lord, you look for people who are completely committed in every way, not people who are just going to try it out. That while your grace and salvation is freely available, and that we have that, it seems that you ask more as we step into the power of your Spirit. So Lord grant us understanding, not just for our minds Lords, because this series is about our hearts. So Lord you are the Spirit who dwells in each one of us, You are the One who speaks through this group, You are the One who gives that power. And Lord we want more of it. I pray on behalf of every single person in this room that we might gain more of that and more of You. We pray this in your name, Amen. Exodus Interactive Forum is a Christian teaching forum where we allow participants to stop the discussion at any time to talk back: participate, ask questions, offer opinions, raise objections and even challenge the presentation. We believe there is no better way to wrestle openly and honestly with the issues we face as Christians. By listening to one another, we leave room to hear the Holy Spirit’s voice through the deliberation of the believers.